Dragon security indicators are shown in the website address bar and tell you about the security of the website you are visiting. Clicking the very first icon displays the site setting menu. Meaning - that the icon in this pane indicates whether or not a sites uses TLS/SSL protocols. You can identify a website as genuine and trusted if it uses a valid TLS/SSL certificate. Invalid certificates could mean that someone is trying to tamper with your connection to the site. Comodo Dragon informs you whether your connection is fully encrypted. If your connection is insecure, third parties might be able to view or tamper with the information you provide on the site. The page is running under HTTP, and is not using an SSL/TLS certificate. Your connection is not secure. Do not submit any confidential data to a page which shows this icon. The owner of the website has not been verified. The connection to the web-page is encrypted and secure. The page uses an SSL/TLS certificate to secure it's content and any data passed between Dragon and the server. Websites that display the lock will have an address that starts with 'https://'. 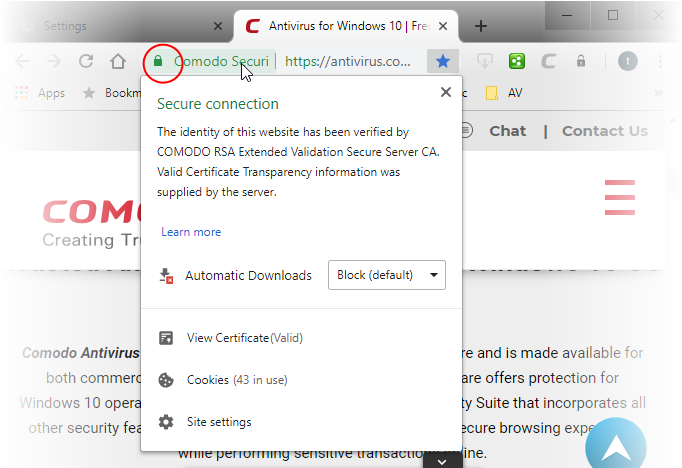 If the site uses an Extended Validation SSL (EV SSL) certificate, the organization's name will appear next to the icon with green text. The page contains some insecure content. For example, mixed content. Mixed content is when a HTTPS page loads some content from an insecure source. High-risk insecure content on the page, or when the site presents an invalid certificate. The upper pane displays the identity information and the lower pane displays and let you change settings for the site that you are currently visit. See Configure Content Settings in Comodo Dragon for more details.